As you can see from a prior post on building raised beds, this is how i garden. I build the soil under the plants so they are always fed. Lasagna gardening is the way to go. This article gives you a lot of good information explaining the importance. I wouldn’t know how to begin a discussion on gardening without beginning with the soil. When I teach a workshop, I ask people what they think of when they think “garden”. Most often, the answer has to do with the harvest. And, of course, we wouldn’t garden if we couldn’t look forward to a bountiful harvest. But, I always encourage my students to think “soil” because healthy soil will result in a healthy, nutrient-dense harvest. A garden with poor soil may produce fruit, but that fruit can’t possibly contain the nutrients, or taste as good, as one grown in soil that has provided all that is needed for its health. And plants grown in healthy soil have less problems with disease and pests. So, what makes soil healthy? Soil is so much more than dirt. One of the components is, of course, weathered rock. That is where our garden plants will receive many of the minerals that they need. 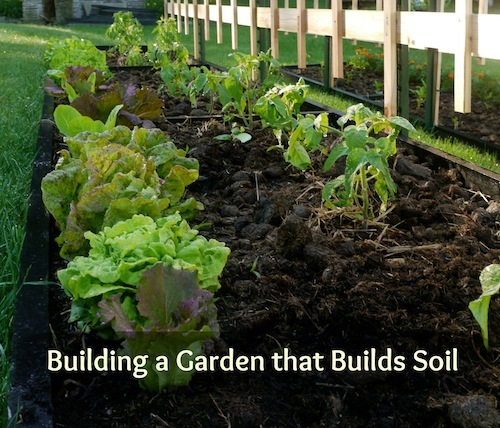 Good soil also contains organic matter – things like worm castings, decomposed leaves, and even the remains of soil organisms like insects, fungi and bacteria. Replenishing organic matter is essential to soil care.